As part of the requirements, we needed to recreate the looks we learned in school at home, so I called in my friend Frances to model for me. For the execution, I let her sit in a sunny spot in our living room so that the lighting is ambient but not too overpowering. Since she's young, I didn't want to have the make-up visibly perceived. I put on the make up much lighter than what I did in school. Also, she was gonna go to Puregold, so yeah, I didn't want to get her any unwanted attention there. Her eyebrows are messy and unshaved, but I think that that's acceptable for young girls. At least they weren't thick and bushy. I love the effect of Fanny Serrano's lip gloss on her (and on every other person I've used it on). 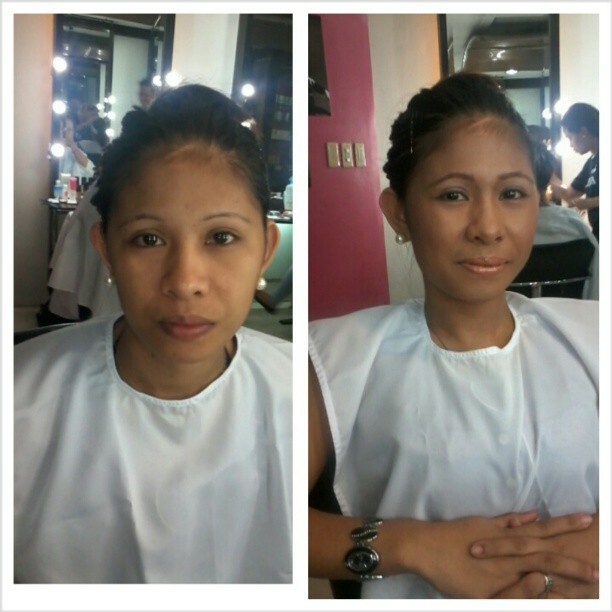 And now this is the before and after photo for the day look with Frances. I basically just revved up the eyeshadow. For the previous look, I had just used a cream colored eyeshadow. Now, I've used my Naked 2 palette to add more browns to her eyelids. I didn't add too much of the shimmery colors in the palette as they will look oily in the photos. As usual, I still kept the look really fresh and natural, so that she can go shopping in peace (ho ho ho). Okay, so much for the fresh look. Now this is the photo of my smoky eye look from school. It doesn't seem apparent in the photo, but I used plum and violet shades for this look, and then blended in the black color from the lashline upwards. As for the eyebrows, she has inherently better eyebrows so they were easier to shape (tee hee hee). Too bad the false eyelashes aren't obvious in this photo. And this is my homework. I happened to drop by my ninang's house, and she was nice enough to allow their helper to model for me for about an hour. Her eye creases are small, but her eyes are deep set which is why the smoky eye looks great on her. In general, I have yet to purchase more foundation bottles and face powders with yellow undertones (than red) because in the photos she looks a bit more tan than usual. Now this is my natural bridal look. I know it looks like a lighter version of the smoky eye, but no, she has an eye crease when her eyes are closed. The lipstick color is also not as dramatic as in the smoky eye look. And this is my homework for the natural bridal look. My model is also a helper of my ninang. I just love how big her eyes are, it's so easy to enhance her eyes because they're already big and beautiful. And here are some snaps of my homework models being vain and sassy. Enjoy! So that wraps up week one, stay tuned for week 2!